Being a client-centric organization, we are proficient in offering a broad range of Limpet Coil Reactor. The given reactor is used for refining and extracting liquids and is widely used in chemical and pharmaceutical industries. Further more, it is readily available in different specifications and can be availed at reasonable price. Avail from us quality assured Limpet Coil Reactor, which is used for the purpose of holding liquid or gases at a specific pressure. 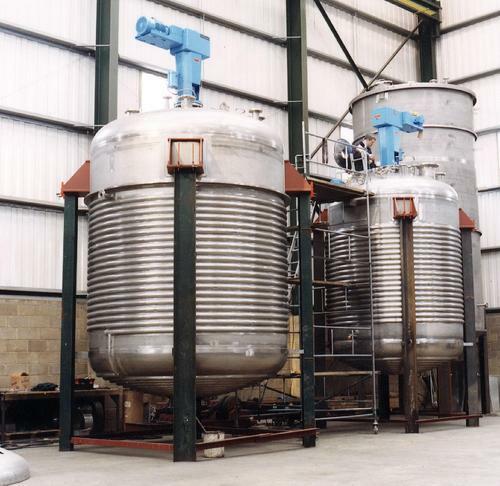 To ensure that offered pressure vessels are able to stand tall on the expectations of patrons, we manufacture these using best grade stainless steel, sourced from certified vendors. Presently, with an experience since 2005, we, Pratham Engineering are placed amongst the paramount manufacturer, supplier & exporter of an extensive array of Process Machines for Pharma, Cosmetics, Foods,Paints, Ink etc .Our collection of these items is extensively used by our clients all across the nation due to their durability, reliability, corrosion & abrasion resistance and excellent performance. These products include Ribbon Mixer, High Speed Shear Emulsifier, Disperser, Coating Pan, Ball Mill, Portable Water Mixing Head For CIP and Portable CIP System. These products are valued in the market due to their elongated functional life. Acclaimed as a privately held firm, we have been able to place ourselves amongst the renowned organizations in the market. We render our clients with an array of immaculate products that are designed in accordance with their specifications. Owing to the modern infrastructure that we have developed, we have been able to meet with the growing requirements of our clients effectively. We have employed qualified professionals striving to serve our customers with products that are manufactured under the international quality norms. Furthermore, we provide customized solutions to our clients based on their demands and assure delivery of all consignments within the promised time-frame. Some of our key customers are Nosch Labs Private Limited, Hyderabad,Adex Composites Private Limited,Akzo Nobel Coating India,etc.